We’d love your help. Let us know what’s wrong with this preview of The Son of Shinar by Chris Hambleton. After thousands of years of war and persecution, all the Jews of the Diaspora have been regathered into the land of Israel. With their enemies devastated in the Magog Invasion, Israel now has enough weapons and energy supplies for seven years. The nation is prospering like never before in history. The Guardians have come, promising to usher in a new era of peace and prosperi After thousands of years of war and persecution, all the Jews of the Diaspora have been regathered into the land of Israel. The Guardians have come, promising to usher in a new era of peace and prosperity for all the earth. But soon after their arrival, the Great Vanishing occurs, removing all the children and millions of people from the planet. To ask other readers questions about The Son of Shinar, please sign up. An inspiring author has written a thrilling series of stories about the “end of times” titled "The Time of Jacob's Trouble Trilogy." He has produced two books and a third one is in the works. 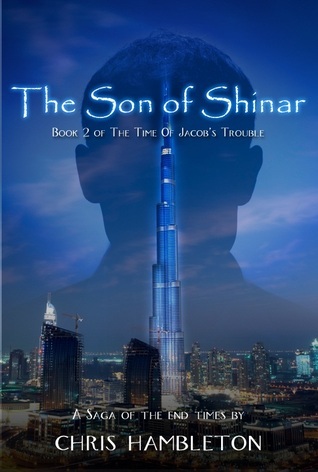 The Son of the Shinar is part two of an exceptional continuing story of the "end of times." The author has a website that displays the first two books of this amazing series. http://www.cwhambleton.com/Home/tabid... The overview from this second book of The Times of Jacob's Trouble Trilogy; The Son of the Sh An inspiring author has written a thrilling series of stories about the “end of times” titled "The Time of Jacob's Trouble Trilogy." He has produced two books and a third one is in the works. The author has a website that displays the first two books of this amazing series. http://www.cwhambleton.com/Home/tabid... The overview from this second book of The Times of Jacob's Trouble Trilogy; The Son of the Shinar from the author "The Guardians have come, promising to usher in a new era of peace and prosperity for all the earth. But soon after their arrival, the Great Vanishing occurs, removing all the children and millions of people from the planet. And now, rumors of a great leader and healer have begun sweeping through Baghdad. Has the Twelfth Imam returned? Could he be the long-awaited Jewish Messiah? It is very thought provoking and on target of what it could be like if the truth of the Holy Bible comes true. The characters are magnificent in their adventures and exploration of seeking the spiritual truth between what they believe is the right decision. They faced their fears and doubts head on as they struggled with their conscious to decide their earthly or spiritual fate. In the author's words" But something inside was still making him hesitate from going down the path that she had chosen. Part of it was the fear of losing his friends and family if he converted to Christianity, but a bigger fear was that what if he was wrong and everyone else was right? What if he somehow couldn't see what everyone else clearly could? Whereas he had once felt fairly certain about his own future, now everything was being turned upside down. This story explores all contents of the Holy Book and is written in a very illuminating and entertaining fictional story. It takes the reader on a spiritual journey themselves; to decide if their fate is really free will or is there a higher being who is compassionate and wants to proclaim the message; time is running out and you need to decide which door to open, eternal bliss or eternal damnation. If one is seeking the truth this series of stories by Chris Hambleton is the portal to enter, the path to explore by taking time to relish in this author’s wisdom. Is it factual or an illusion while having fun reading inspiring tales of the "end times". The conflict is stimulating to the reader’s mind, as it describes the theories of the various faiths and how they think the end will occur. I began my first book titled "Project Exodus" in the fall of 1992 when I started college. This was before the days of Print On Demand publishing (POD) and the book ended up being shelved when my engineering coursework became more difficult. Fast-forward to 2005, when I had taken up an interest in studying the Antediluvian Age and the Ice Age that followed. I looked around for a book that accuratel I began my first book titled "Project Exodus" in the fall of 1992 when I started college. This was before the days of Print On Demand publishing (POD) and the book ended up being shelved when my engineering coursework became more difficult. Fast-forward to 2005, when I had taken up an interest in studying the Antediluvian Age and the Ice Age that followed. I looked around for a book that accurately portrayed it, and since the few I found (at the time) weren't what I was looking for, I decided to go off and write my own. A few outlines later, I found that I had come up a framework from which many books could be written. Meanwhile, the situation in the Middle East began to heat up with the Iraq War, and the subsequent nuclear race of Iran. I felt led to write another book detailing the roles of these nations (among others) according to my views and interpretations of the Bible. And thus "The Time of Jacob's Trouble" was born. While that book was going through the publishing process, I went back and re-visited "Project Exodus" and ended up re-writing most of it, keeping only the rough plot and a handful of scenes. This was later renamed "Endeavor in Time" and happened to be published a week or so before the first book was released. In the spring of 2010, I was able to go on a study tour in Israel which had a deep impact on my understanding of the land and the Jewish people. Soon after I returned to the States, I began researching Israel's history again and decided to rewrite "The Time of Jacob's Trouble" into a trilogy, which has been released in 2011. I'm also the creator and owner of the EzekielWatch.com website, which tracks the latest news and developments in the Middle East, along with a comprehensive study of the Ezekiel 38-39 prophecy and dozens of news links to the nations involved in the future invasion of Israel.